Enter the Gungeon is a stately two years old now, but developer Dodge Roll isn’t content to let it fade into the sunset just yet. They’ve been planning a major update for more than a year now, and they’re just about ready to unleash it. The expansion is called, appropriately, Advanced Gungeons & Draguns, which is in keeping with the game’s preference for on-the-nose wordplay. Dodge Roll says it includes “hundreds” of new rooms, dozens of new weapons, plus more weapons, items, and ammo types. 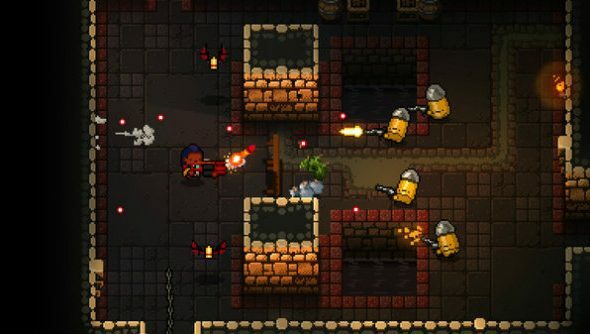 The developers also say it’ll feature more generous drop rates, which is certainly welcome – vanilla Gungeon could easily feel pretty stingy when it came to doling out the wacky weapons. We love indies, and we think you will too. Here’s our list of the best indie games to play on PC. If you’re unfamiliar with Enter the Gungeon, it’s a rogue-lite bullet-hell shoot ‘em up in the vein of The Binding of Isaac, just with less childhood trauma and more references to popular movies and videogames. When you pick up a new gun in Gungeon, chances are it’s either a visual gag or a loving homage to one of its game brethren. Advanced Gungeons & Draguns is going to keep up this tradition. They’ve added Destiny’s Gjallarhorn to the mix, for instance. The best part is, the Advanced Gungeons & Draguns expansion is completely free if you own the game. Dodge Roll did the same thing with the last expansion, Supply Drop, which came out in January 2017. Check it out on Steam for more details. Advanced Gungeons & Draguns should be available Thursday, July 19th.